THIS VIDEO HAS WHAT YOU LOVE MOST ABOUT NEW ENGLAND! Beginning at West Quoddy Head Maine by the Canadian border	this video meanders down the coast showing unique lighthouses and the coast. A Nor'easter Storm, Shipwrecks and Nantucket Island. Wooden traps are set, hauled, unloaded, baited and repaired. Brilliant foliage, winter snows, and a gentle spring. Authentic sugar houses provide a beautiful setting for understanding all that goes into this favorite breakfast treat. Trees are tapped by brace and bit on snowshoes. the entire sugaring process is shown as it proceeds into the night. 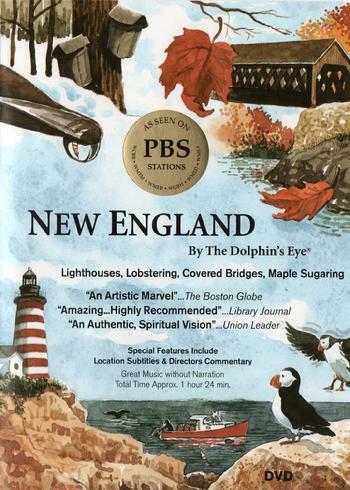 "Unlike other travel (programs),this one is an artistic marvel"
"Your video is nothing short of magnificent, a true feast of nostalgia and a tribute to the New England for 42 years had been my home. Your balance of seacoast and mainland footage matches my life-20 years on the South Shore20 years near Peterborough N.H. It was all there, and a powerful experience. Thank you"	viewer Czech Republic"
"	I stumbled across your productin on PBS about New England last week. It may have been titled "The Dolphin's Eye". Since I am housebound and disabled,I am unable to travel. You will never know what this film meant to me! I love my New England and this allowed me a "trip""to all my favorite places! I shed many tears out of sheer appreciation of your tremendous photographyand time spent making this video! When will it be shown again? I'd love to have the pleasure of seeingthe whole film! What a blessing from God! Can I rent it or buy the video? viewer from Maine"
Total DVD run time approx. 1hour 24 min. PHONE 603 724 2206 to place your MASTER CARD or VISA order Today!